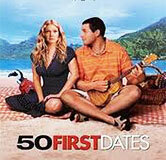 Some of the Cast of "50 First Dates"
>> Adam Sandler was credited as actor. >> Rob Schneider was credited as actor. >> Dan Aykroyd was credited as actor. >> Drew Barrymore was credited as actor.